The Mid-America Summer Nationals will take place August 27-28, 2011 at Chouteau Bend Recreation Area on Grand River in Chouteau, Oklahoma. The race is being promoted by Green Country Drag Boat LLC., and sanctioned by the Southern Drag Boat Association (SDBA) the oldest and largest drag boat sanctioning body in the nation. With over 100 race teams and their families showing their passion and competitive drive on the liquid quarter-mile, making the Mid-America Sumer Nationals one of the largest drag boat races in the nation. There will be 12 racing classes of competition ranging from Personal Water Craft (Jet Ski) to Top Fuel Hydro, and speeds ranging from 70 MPH to over 240 MPH. 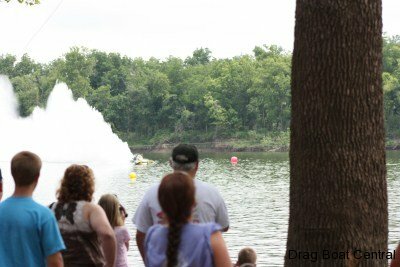 The Chouteau Bend Recreation Area offers an up-close view of the races, as well as large mature shade trees that keep the hot Oklahoma sun and August heat at bay while spectators watch Top Fuel Hydro’s try to set new world records at speeds in excess of 240 MPH. Only 30 minute drive East of Tulsa on Hwy 412. And on the West side of the Grand River.